Keto Bacon Wrapped Cheddar and Garlic Jalapeno Poppers are spicy, creamy, cheesy, and bursting with bacon flavor in a simple low carb appetizer that everyone loves! Great for parties, tailgating, or BBQ dinners. If you’re looking for delicious, savory, and addictive appetizers for a party, it can get a little hard if you’re sticking to a low carb diet – since so many things revolve around chips, dips, and crunchy, salty, carb-packed snacks. These keto stuffed jalapeno poppers are a delicious, simple, and super easy keto appetizer recipe that is perfect for parties – and a hit with people on low carb diets, or not! These jalapeno poppers are “naked” – and even though they pack a spicy punch, they are totally delicious and bursting with cheesy garlic flavor that pairs perfectly with a crunchy strip of salty bacon for the ultimate keto diet appetizer! 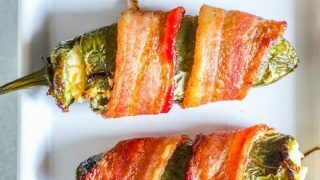 I hope you love these easy cheddar and garlic bacon wrapped jalapeno poppers as much as we do! 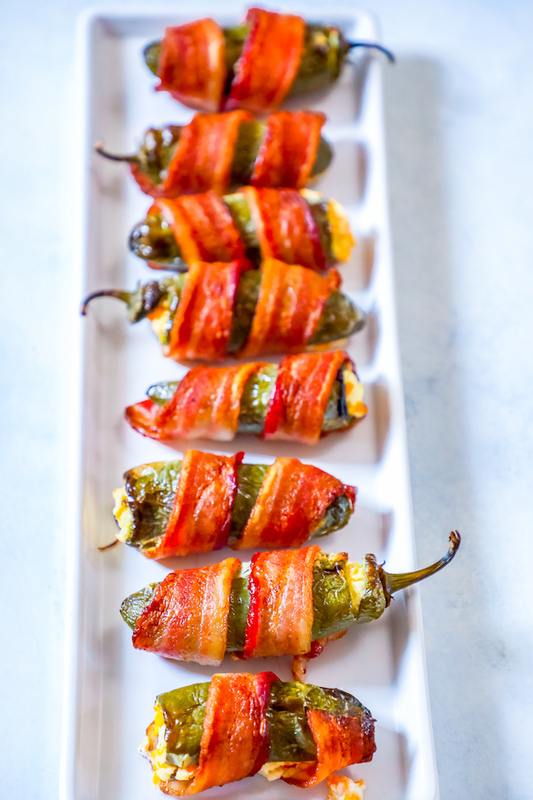 Just Take Me To The Best Keto Jalapeno Poppers Recipe Already! If you’d like to skip over my tips and tricks to the best easy keto jalapeno poppers every time and get straight to the recipe, please scroll to the bottom of the page. I get a lot of requests for similar recipes and questions on my posts, so I try to add as much information as possible! Please scroll to the bottom of the page if you’d rather skip over it. 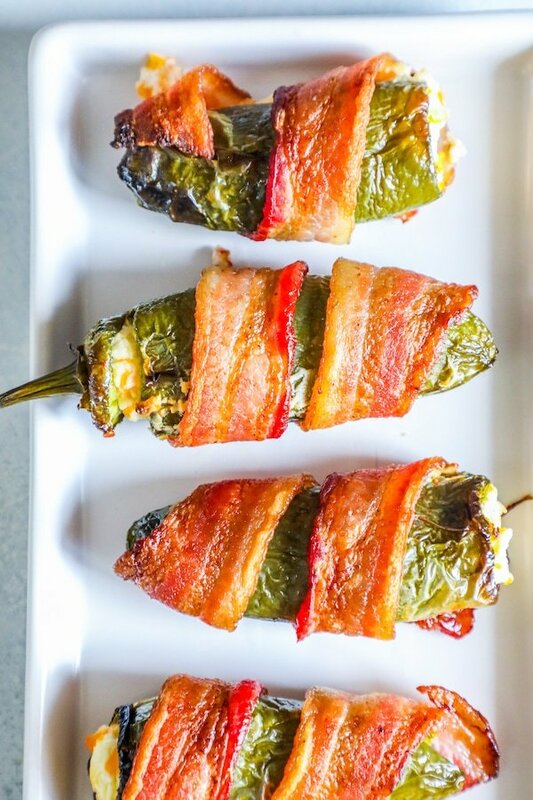 If you love this Easy Keto Bacon Wrapped Cheddar and Garlic Jalapeno Poppers Recipe, you will love my other favorite low carb meals! I love to try new delicious takes on low carb recipes – here are some of the ones I love! To get the best Bacon Jalapeno Peppers Recipe results everytime, follow my handy tips and tricks! -Give them space. To get perfectly crisp bacon, it should have space around it, so it doesn’t sit next to other poppers – or it will come out soggy and not crisp! -Set it on a rack. 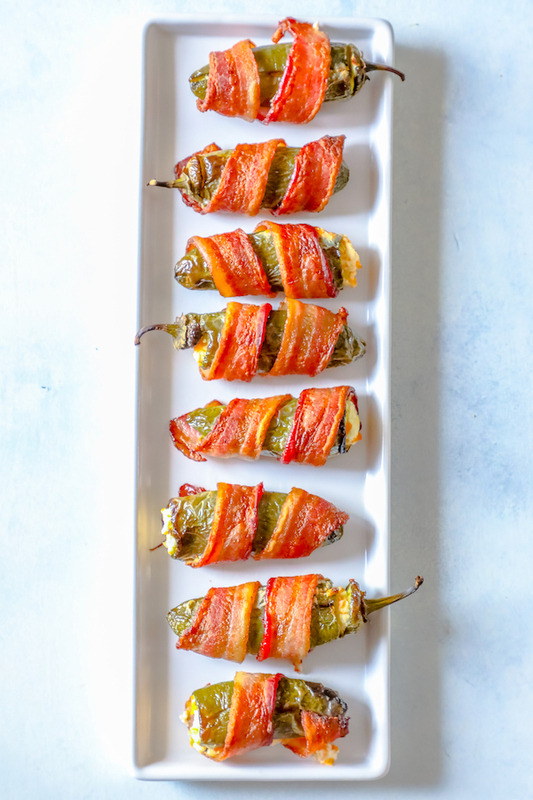 I like to cook these by putting them on top of a cookie cooling rack on top of a baking sheet instead of placing directly on a baking sheet – this helps air circulate around the poppers and helps the bacon crisp evenly! -Handle with care. Since these poppers don’t have a batter around them, the bacon can fall off if you handle it too much. Minimize how many times you pick up the bacon to keep its shape! 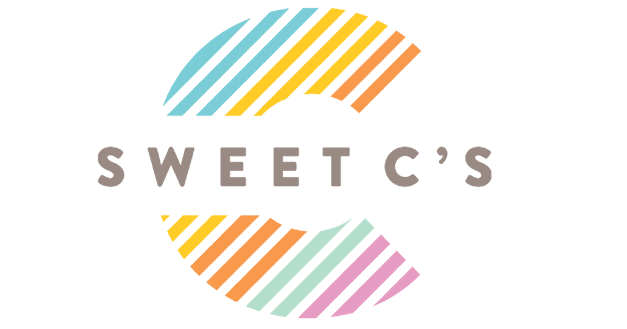 -Make ahead and bake right before your party. 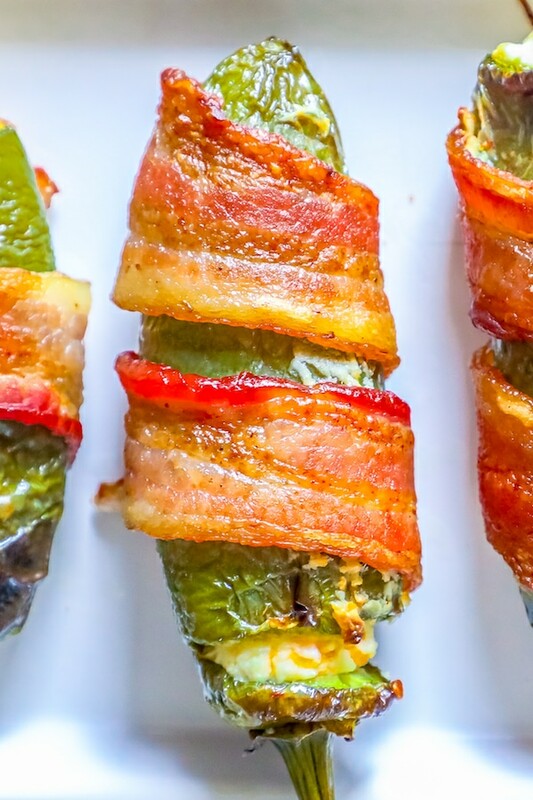 These bacon wrapped jalapeno poppers can be assembled up to 24 hours ahead of your party (be sure to wrap tightly with plastic wrap and refrigerate if pre-assembling.) so there is no excuse not to have a batch whipped up and ready to go when it’s party time – just pop them in the oven before the party starts! Cookie cooling rack that fits over your baking sheet. 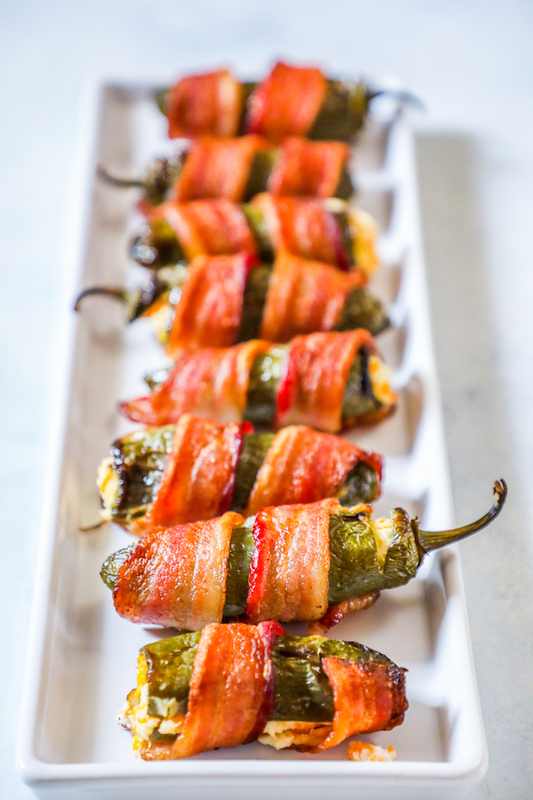 If you love this Bacon Jalapeno Poppers recipe as much as I do, please write a five star review, and be sure to help me share on facebook and pinterest! Sharing a “made it” pin on Pinterest with a picture is a huge help to me, and is the best way to make sure more people see delicious, easy recipes that really work! Cut a long slit in jalapenos, remove seeds and white membrane. In large bowl, combine salt, cheddar cheese, cream cheese, and garlic powder. Stuff cheese mixture into jalapenos. Place on cooling rack on top of baking sheet. Bake 25-35 minutes, until bacon is crisp around peppers and cheese is hot and bubbly.